Okay I'll try to make this as brief as possible. Once upon a time I was having issues with my TPS so I decided to set the timing to -16 degrees without the car being in normal Diagnostics mode. The reason I did this is because I could not get the car into normal Diagnostics mode because I was getting a code 7 and 11 whenever I jump the Diagnostics plug under the engine bay. Present day, I got a new TPS and set it properly and am able to get the car into normal diagnostic mode where the check engine light is blinking once every 3 seconds, however, using a timing light ,when I go to set the timing, when it flashes, the mark on the crank shaft pulley is so far to the right past the timing indicator on the plastic cover piece. Even when I turn the distributor all the way counterclockwise it's still is not quite reaching the timing indicator marks... I've tried increasing the idle and resetting my TPS however I can't get my TPS set correctly if I do this and car won't go into normal Diagnostics mode if I do that. What can I do in order to get my timing mark indicator in the realm of where it might be possible to set this timing correctly at negative 10 degrees in normal Diagnostics mode? Last edited by notnilc20 on Fri Apr 27, 2018 9:28 am, edited 1 time in total. Can think of a couple things, maybe distributor is a tooth off? Although I would think the engine would run really crappy. Other possibility is the crank mark is off. It's a know thing to happen that the rubber layer in the pulley cracks and it starts moving. To check that you;ll need to be able to verifiably position the crank at TDC. There's the stick down the spark plug hole of piston 1 and move the crank until you see it at the top of movement, then see if the timing mark matches. in again. Then just rotate the dissy to correct the timing in the normal way. taroroot wrote: Can think of a couple things, maybe distributor is a tooth off? Although I would think the engine would run really crappy. Other possibility is the crank mark is off. It's a know thing to happen that the rubber layer in the pulley cracks and it starts moving. To check that you;ll need to be able to verifiably position the crank at TDC. There's the stick down the spark plug hole of piston 1 and move the crank until you see it at the top of movement, then see if the timing mark matches. Awesome...i have hope.... you guys are the best! Oh my.... this could very will be my issue as well. Because I set the timing at -16 degrees about a year and a half ago.. and for some reason it's about 20 degrees off just like what you're saying. So if this is the issue wouldn't you need a new crank pulley because it's going to happen again and again and get pretty annoying. I'm still confused as to how or what is slipping or moving off kilter because i thought the crank pulley was a solid piece...?? The original 4age crank pulley was a two piece that had some rubber piece holding it together. Pretty sure that rubber piece holding it could be the cause of the slippage. Once that starts happening, you better replace the pulley or it will fly off! lets say I do need a new crank pulley....i have one from an mr2 but the outer belt is thinner (4 ribs vs 5 ribs) than the ae86 belt for the powersteering and ac. Also i've heard that the acc. pulleys dont line up with the mr2 pulley either and that the back side of it needs to be machined down??? Any truth in that? water pump pulley wont line up as well since the ae86 water pump is longer. If you are still running acc you should just buy a solid crank pulley from T3 or NST, that way you don't have to mess around with machining current pulleys etc. aukword1 wrote: water pump pulley wont line up as well since the ae86 water pump is longer. If you are still running acc you should just buy a solid crank pulley from T3 or NST, that way you don't have to mess around with machining current pulleys etc. I heard aluminum lightweight pulleys are not good for the balance of the crankshaft and can lead to engine problems rather quickly? What are your opinions?? I looked at t3's pulley and they say they are balanced...so that may be the route I take.....thanks for the info. I ran lightweight pulleys in my old G35 for like 10 years with no issues. I also ran T3's pulley on my old 4ag motor for a couple years with no issues either. Personally, I don't know anyone who has had any issues running aftermarket pulleys that ran into excessive bearing wear at the crank. aukword1 wrote: I ran lightweight pulleys in my old G35 for like 10 years with no issues. I also ran T3's pulley on my old 4ag motor for a couple years with no issues either. Personally, I don't know anyone who has had any issues running aftermarket pulleys that ran into excessive bearing wear at the crank. Thanks aukword1....i really appreciate your help. I hand-cranked the crank 2 top dead center mark and check the mark on the camshaft on the intake side through the oil filler to verify that it was set at top dead center on the compression stroke. Everything lined up good. After several attempts I was able to move the distributor teeth to where I can set the timing to 10 degrees while in Diagnostics mode. So although nothing went on the first try things were coming together and it seems like I was going to finally get this figured out. However when I removed the jumper from the Diagnostics plug the car went to about negative 15 degrees but the idle was pretty high. So I turn the car off and start it up again and the timing was back to almost zero degrees on the indicator marks. So I don't know why it's jumping around on me like that but it's a little bit frustrating. Any ideas? Now ive really screwed things up. I messed around some more with it and now the car barely idles and does not rev at all...just slowly idles. I can't get it even back to running how it was before all this started. After the car died i started to turn the crank with my wrench and forgot to turn the ignition off with the key....and the crank kicked my wrench a bit ..... now im having those issues i mentioned with the car running very poorly.....i tried resetting everything back to tdc...including distributor....and no good. Same issue. Car running like shite....what the heck?? With all those issues, it sounds more and more like your timing belt may have jumped a tooth. How old is the belt? I would remove the front cam belt covers and verify that the cams are set correctly. You probably need to adjust belt tension or replace the belt. davew7 wrote: With all those issues, it sounds more and more like your timing belt may have jumped a tooth. How old is the belt? I would remove the front cam belt covers and verify that the cams are set correctly. You probably need to adjust belt tension or replace the belt. Yeah.....i hope you're right....i'll just have to take the front cover off and see what's going on under there. Thanks for the help. scalpel wrote: Is it Fixed? 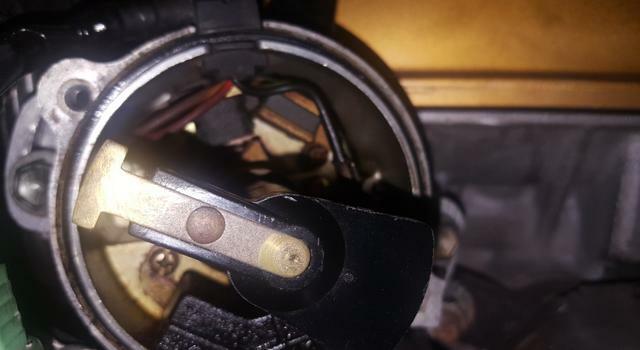 I checked the timing marks and they all lined up...belt seems good and taught (it's a brand new belt)....i lined the marks on the distributor and aligned the distributor in the mid way when installing it and car wouldnt even try to fire when cranking. Then I rotated the distributor all the way counterclockwise and it fired and ran but idled very low and rough and wouldnt rev when pushing accelerator. So i thought maybe if I skipped a tooth (as suggested above) i could get it to run better...so I did and it did.....but it idles high at around 2k rpm....now i just backed the idle screw off and got the idle to around 1200-1500....any lower and it wants to die and runs really rough. I checked the timing with the light and it sits around -15 deg. But jumps around because the idle is not stable. I may need to take it to someone who knows older cars....i just dont get it though....why wouldnt car run with all timing marks set correctly and dist. set correctly. Why do i have to set dist. one tooth off to get it to act right? Like davew7 said, it seems like the belt jumped a tooth....but the cams are lining up everytime with tdc.....thanks. I would make sure the crank is actually TDC by removing the 1st cylinder's spark plug and putting something in there like a stick or something. Once the stick reaches the highest point your at TDC. Then check the cams to make sure they line up at that point. If all that is correct then the distributor isn't lined up properly. They can easily get offset a tooth or two when inserting it. aukword1 wrote: I would make sure the crank is actually TDC by removing the 1st cylinder's spark plug and putting something in there like a stick or something. Once the stick reaches the highest point your at TDC. Then check the cams to make sure they line up at that point. If all that is correct then the distributor isn't lined up properly. They can easily get offset a tooth or two when inserting it. Yeah.....good idea...i'll try that later today, thanks. to check if distributor is set correctly, I like to remove the cap and look at the rotor and the sensor lobes. WIth all the timing marks set correctly and at TDC, you should be able to visually verify that the rotor is pointing at spark plug 1. Set the crank to firing position, I think 10DBTDC and visually verify that the sensor lobe is lined up with the magnetic sensor in the distributor. If you're a tooth off it'll be obvious. taroroot wrote: to check if distributor is set correctly, I like to remove the cap and look at the rotor and the sensor lobes. WIth all the timing marks set correctly and at TDC, you should be able to visually verify that the rotor is pointing at spark plug 1. Set the crank to firing position, I think 10DBTDC and visually verify that the sensor lobe is lined up with the magnetic sensor in the distributor. If you're a tooth off it'll be obvious. Ok i set the crank to 10 degrees btdc and here is what the rotor looked like...of course this is deliberately setting the distributor tooth one off. i made a mark on the lip of the distributor and highlighted it yellow as to where the #1 cylinder terminal is on the distributor cap. From this angle it looks like it will fire too late?? Remember this is at 10° btdc. Also if you look at the first pic you can see the distributor is set all the way clockwise it will go.....thoughts?? Thats where you want it. Just leaving the #1 cylinder mark. aukword1 wrote: Thats where you want it. Just leaving the #1 cylinder mark. UPDATE!! I finally got it sorted. First off special thanks to Jondee86 for the excellent spot on info.! I set up the TB and TPS and what my main issue was....was the distributor kept turning before I could install it into place and causing me issues....even after I took the dist. Cap off and held the rotor in place it still took me a few tries to get it lined up properly....finally I was then able to put car into diagnostics mode and time the engine to 10 deg btdc and i was able to adjust the idle using the screw located on the tb as mentioned above. when the jumper was removed, the engine did not die on me...and the timing was moved to 16 deg btdc. Woo Hoo! Here is a video I made on the entire process.